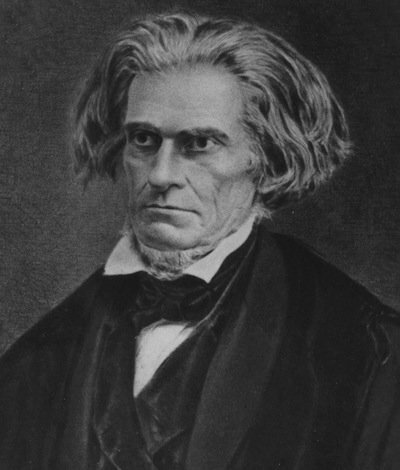 Most people who remember John Calhoun from their history books think of him as the fiery senator from South Carolina who defended the antebellum South and once called slavery a “positive good.” But Calhoun also fancied himself a political philosopher. In the early 19th Century, he wrote a treatise laying out his theory that a small group of states should have the right to block legislation—to exercise a “minority veto”—in order to preserve their way of life. It was a thinly veiled rationale for preserving slavery, even as the rest of the country was turning against the institution, and it became a moot argument after the Civil War. But 150 years later, Calhoun’s ideas about government—the idea that a minority of voters should have the right to dictate policy to the majority—are making a comeback. It’s taking place in the swing states that re-elected President Obama, starting with Virginia. By now, you may have heard about the scheme state Republican lawmakers there are talking about imposing. Under a proposal by state Senator Charles Carrico, a conservative Republican, Virginia would no longer award all of its electoral votes to the candidate who wins the most votes in the state, as most other states do. Instead, it would award the bulk of its electoral votes by congressional district—that is, the candidate who wins the most votes in each district would win that district’s votes. Under the scheme, the state would also award two “at-large” electoral votes to whichever candidate wins the most districts. The idea might not seem so objectionable at first blush: The constitution gives the states the right to apportion electoral votes however they please and two states, Maine and Nebraska, already award votes based on congressional district. But Virginia, like so many other states, has gerrymandered congressional districts, concentrating liberal votes (read: poor, urban, African-American) into a handful of districts that end up sending Democrats to Congress, while spreading out conservative votes (read: rich, rural, white) across more numerous districts that end up sending Republicans. Slate’s Dave Weigel, who was among the first to write about this story, reexamined the 2012 election results to see how Virginia would have cast its electoral votes if the Carrico scheme had been in place. It turns out Mitt Romney would have won nine of the state’s electoral votes, leaving only four for President Obama, even though Obama won the state’s overall popular vote by a four-point margin. Carrico told Weigel that the split isn’t “really a partisan issue” and that it could, conceivably, “cut both ways.” My colleague Nate Cohn has crunched the numbers and, lo and behold, Carrico may be right: Virginia’s future as a Democratic state in presidential elections is sufficiently uncertain to make this change a risky political proposition. But Virginia Republicans aren’t the only ones thinking about such schemes. Their colleagues in Michigan, Pennsylvania, and Wisconsin are contemplating similar changes. Notice something about those states? They’re all states in which the state as a whole is voting more and more Democratic, but in which Republicans still control state legislatures, giving them the power to draw congressional districts so that they have disproportionate representation. Jordan Gehrke, a Republican operative who hopes to make this a national crusade, tells the Atlantic's Molly Ball that the scheme would stop presidential candidates from ignoring rural states. I wonder if Gehrke has spent much time in Iowa and New Hampshire, which didn't exactly hurt for attention in either the primary season or general election campaign. In any event, our system of government already has lots of mechanisms for protecting the interests of rural voters, as individuals and as a group. The biggest and most obvious tool is something called the United States Senate, in which predominantly rural, thinly populated states like Arkansas and North Dakota have the exact same representation as more urban, densely populated states like California and New York. To grasp the real agenda at work here, pay attention to what Reince Prebius, chairman of the Republican National Committee, said during an interview with the Milwaukee Journal-Sentinel: “I think it’s something that a lot of states that have been consistently blue that are fully controlled red ought to be looking at.” Note that he’s not recommending similar changes in Alabama or Texas, where such changes would shake loose a few Democratic votes around the big cities. (Gehrke, to his credit, at least says he'd like to apply the scheme in states where Republicans might not benefit.) This is a power grab, pure and simple. And you can see why Republicans think it’s necessary. Republicans today face an increasingly desperate political predicament, similar to the one that Calhoun and his contemporaries faced in the early 1800s. They are a sectional party whose ranks are dwindling, relative to the rest of the country. Since they don’t want to give ground on their political agenda, they’re grasping at levers for thwarting the majority. In Congress, that has meant transforming the filibuster into a routine means of blocking simple majorities from passing laws. (Among those who have observed the parallels to Calhounism are James Fallows.) More recently, in state capitals of conservative states, it has meant taking advantage of lingering majorities there to ram through policy changes, like eliminating income taxes, that will undermine the welfare state for generations. Yes it is—particularly when you consider just who would lose influence if these changes took place. “If implemented on a large scale,” writes Jamelle Bouie of the American Prospect, “this scheme would result in mass disenfranchisement… And given the states in question—Virginia, Pennsylvania, Wisconsin, and Michigan—a large number of those disenfranchised would be African Americans.” It would be tantamount to ending the principle of one man, one vote in those areas. Of course, Republicans don’t describe their campaign as an effort to diminish the power of non-white Americans. They say they are simply championing the interests of rural voters, in order to protect their interests and way of life. Then again, that’s what Calhoun claimed to be doing, too.